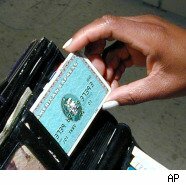 American Express announced Monday that it's going to allow its Membership Rewards customers to pay their federal and some state and local income taxes using membership rewards points. Whether it's a good deal or not depends on how desperate you are. First do the math. Let's say you owe Uncle Sam $5,000. When the reward transaction goes through one of Amex's preferred tax payment processors -- either Pay1040 or Official Payments Corp. -- the processor charges a 2.35% "convenience" fee. So, your American Express account will be charged for $5,117.50, then Amex will immediately credit the charge using points. You won't get additional points for this exchange. For the most part, Amex gives its cardholders one rewards point for every dollar spent on the card. Sometimes there are special opportunities to earn double or triple points, but not often. In turn, Amex negotiates a reward rate with each of its reward partners. As a general rule, every 100 points is worth $1 on a gift card. Other kinds of reward exchanges are not as favorable, including this deal with tax payment processors Pay1040 or Official Payments Corp., where paying $1 to the IRS requires 200 Membership Rewards Points. At that rate, in order to pay off your $5,000 tax bill plus the "convenience charge," you would need to have 1,023,500 Membership Rewards Points. How many people have that many points? American Express spokesperson Mona Hamouly says, "That's getting into the granular card member information that we don't release, but we definitely have card members who have millions of points." I'm sure that's true. Disbarred lawyer-turned-Ponzi schemer, Scott Rothstein, reportedly racked up more than 20 million Amex points. So if you're in a jam and really need to find a way to pay your tax bill and you're a big user of your Amex card, this plan looks as good as any. But is there anyway to squeeze more rewards out of these points? American Express doesn't let you turn Membership Reward Points into cash, but it does let you pay what it calls Every Day Charges with rewards points. For instance, I put gasoline on my American Express and if I were so inclined, I could pay the bill with points at the rate of 166 rewards points for every $1 worth of gas I purchase. That's obviously better than the tax exchange rate of 200 rewards points for every $1 spent. So between now and April 15, if I charged $5,000 worth of Every Day Charges like gasoline and groceries -- another Every Day possibility – and paid them off with 830,000 points while putting the cash I didn't spend in a savings account and paying Uncle Sam on time with a check, I could save myself the $117.50 "convenience" fee and still have at least 193,500 points in my Membership Rewards Account. For 193,500 points, according to Amex's Rewards website, I would have just about enough points to go skiing for three days in Vail, Colo., and stay in a luxury hotel – a much-deserved reward for being so smart.